I just started on a new felting project, a little girl with roundish pigtails. I am going to be making a larger cloth version for my daughter’s birthday and decided a miniature one would be a good trial run. Anyways, when I started to “color” in her face, I realized that I was using tea colored wool for her skin. I thought that perhaps other felters could benefit from this. I follow the same method that I use for dyeing wool with food coloring and substitute brewed tea for the food coloring. It creates a very soft beige that is hard to produce with food colors. I will have to find some time to research natural dyes and experiment a little. But for now, I will just be happy that I can make more beige with a little bit of tea whenever the mood for felted baby dolls hits me! Give it a try. I wonder if different kinds of tea produces different shades of beige? This needle felting tutorial is a very colorful one . . . a felted rainbow. I designed this rainbow when coming up with different charms to hang from a mobile; however, you could hang it from just about anywhere! I was a bit intimidated by the rainbow part of this rainbow, but it is actually easier than it looks! First, draw and cut out a rainbow template. Place it on a tuft of spare wool(it will be covered later) and needle felt around the outside of the template. This creates an outline on the tuft of wool. Next fold the extra wool towards the center of the outline and needle felt into place. Between the bottom of the arc, the wool needs to be carefully pulled apart before pulling it to the center. Flip the felted piece over; then needle felt the back. A clover pen speeds this part up a bit. Then take a single felting needle and reinforce the edges. 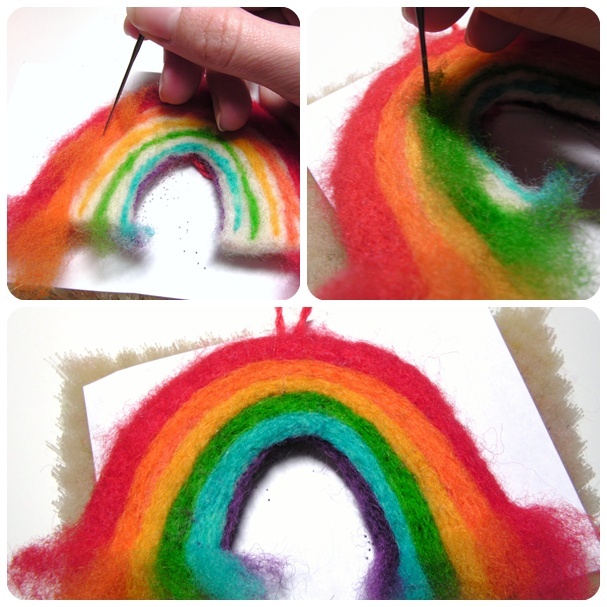 Switch to a smaller needle(larger number) and needle felt the entire rainbow, the front, back, and edges. Continue felting until the shape is solid. 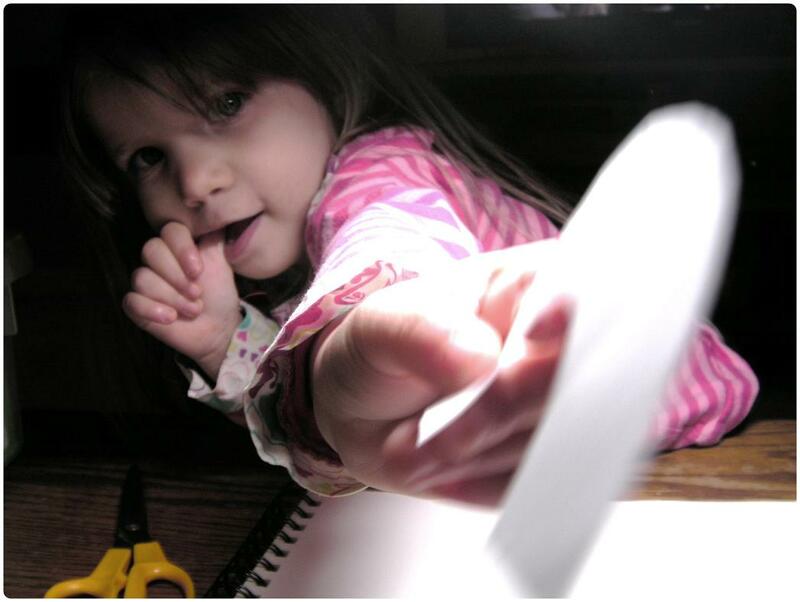 Here is my little “helper” handing me my paper template. So cute . . . Now on with the tutorial! Remember ROY G. BIV, for some reason I can’t forget. Simple needle felt a line of red, orange, yellow, green, blue, and purple onto the felted rainbow. These will be our “coloring” lines. Next add a hanger, if you would like. My hanger is a constructed from twisted embroidery thread. Pull it up through the center of the arc, back down through the center, and tie it off on the bottom of the arc. Start coloring in your rainbow. Make sure that your felting needle remains vertical, so that any wool pulled through to the opposite side is lined up with the rainbow design. Carefully felt over the knotted embroidery thread; you don’t want to break a needle! Flip it over, the opposite side has a hint of rainbow. Simple follow this “hint” and needle felt the rest of the rainbow. Keep the felting needle vertical so that the colors don’t become mixed on the finished side. Two small balls are used for the clouds. 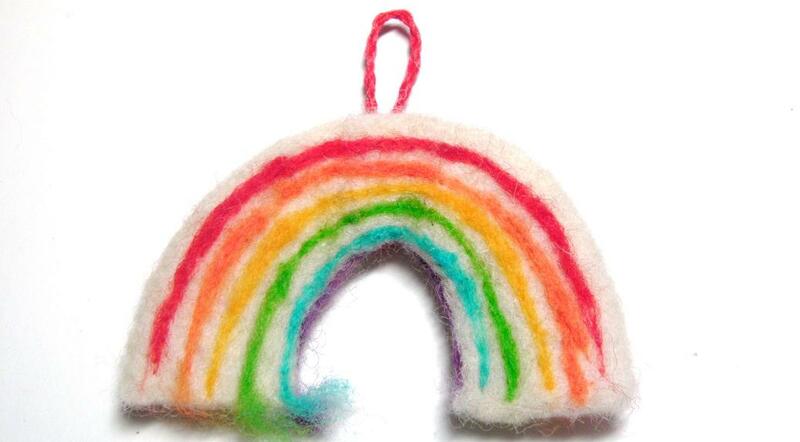 Wrap the unfelted wool on one side of the rainbow around a ball and needle felt it. Continue until the ball is secure. Repeat with the other side. Next clean up the clouds a bit. Add some white wool to the base of the rainbow and needle felt it into place. Keep adding white until no color is peeking through. Add some cute faces if you would like. And the felted rainbow is complete. This rainbow will take around 3-4 hours to create. Be patient with the rainbow stripes and all will be well! Good Luck. Last week, I needle felted my first baby mobile charm and this week I wanted to share a felting tutorial on my second mobile charm: A Happy Sun! Simply put, mobile charms are small toys attached to a baby mobile. I always switched up the toys on my children’s mobiles and I decided to make a few of the felted variety. I just love handmade additions to a nursery. 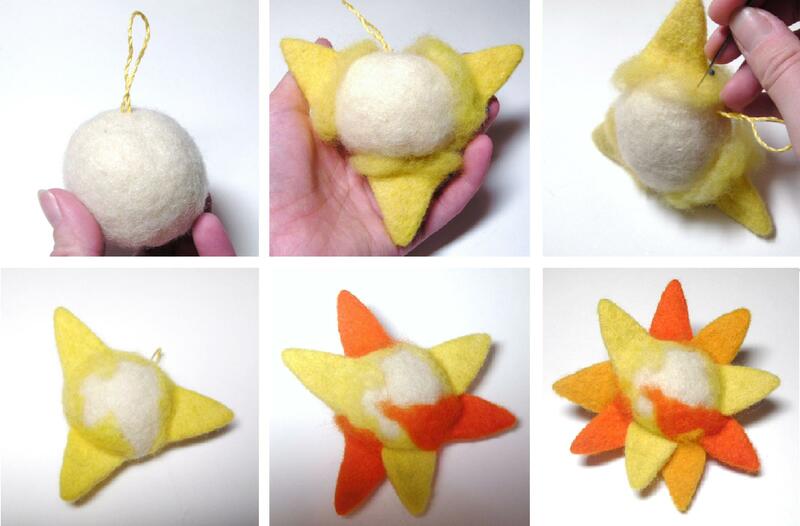 This sun is a basic design made from a wet felted ball and a grip of needle felted triangles. It is a pretty easy project, but the triangles are a bit tricky to get just right! Here it goes . . .
You need: Wool roving/batting, felting needles, felting pad/brush, and embroidery thread. A wet felted ball is used for the base of this sun toy. Follow my tutorial on wet felted balls and then move on to the triangles! Needle felted triangles will represent the rays of the sun. A triangle template will help ensure that all of the triangles are roughly the same size. Just cut a triangle out of a piece of paper; use the wet felted ball to estimate the appropriate size of the triangle/ray. I like to place a piece of paper between my wool and felting brush; it creates a smoother finish. Place the template on a tuft of wool. Then needle felt around the edges to create an outline of a triangle. Take the extra wool from a side of the triangle, fold it to the center, and needle felt it down. Do this on one more side. Do not felt the third side of the triangle; the unfinished side will be used to attach the triangle to the ball. Now, needle felt the 2 edges of the triangle. Then needle felt the top of the triangle. Flip it over and needle felt the opposite side. Size down a needle and needle felt the entire triangle once more. Compare the completed triangle to the template as you go, making sure that you do not change the overall shape and size too much as you felt. Take the wet felted ball and a piece of paper. Draw a circle around the ball. As the triangles are created, lay them out along this circle. Keep making triangles until the entire circle is outlined with them. If you would like, now is time to attach the hanger to the felted ball. Follow my tutorial on this, if you need a little help! The tutorial will give similar results to the hanger on the sun; the only difference here is that I am using twisted embroidery thread to create the hanger! Next pin the triangles to get an idea of where they should be placed. I made three sets of three colors and decided to felt them into place in a pattern. First I placed the three bright yellow triangles equally around the ball and needle felted them in place. Then I did this with the orange and finally the golden yellow. Next, needle felt the main color onto the ball. Felt the front and back side of the sun making sure that the core color does not peek through. A good light is necessary during this stage! Use a smaller size felting needle(a larger number) and felt it again; this will help smooth out any lumps and bumps. The final step is needle felting a sweet little face. Again, I have an easy tutorial for this if you need a bit of explanation! The smiling sun charm is now complete. 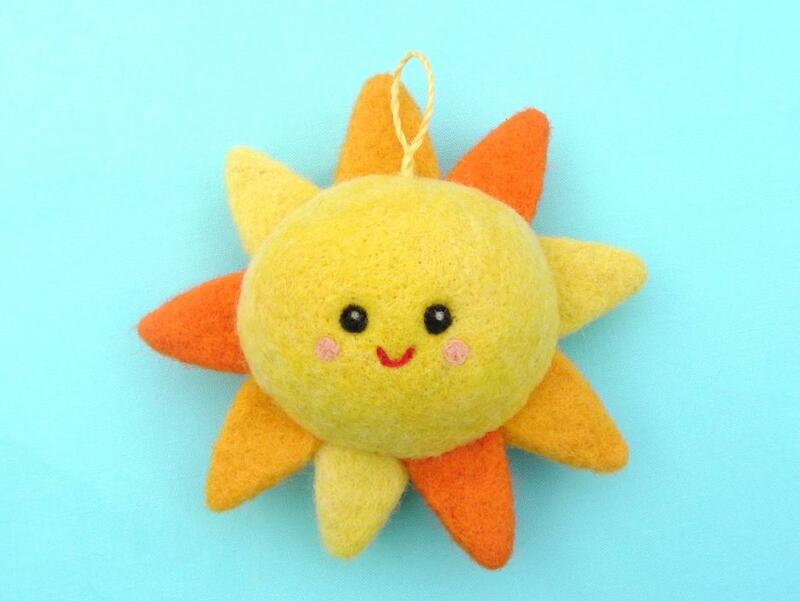 This toy sun is sure to brighten any child’s nursery! I’m excited to get started on more baby mobile charms; they are such fun and adorable too. Good Luck! I had so much fun needle felting this happy rain cloud. This little guy is my first charm for a baby mobile. Over the next few weeks, I will be sharing different felted pieces that could combine to create a very soft, happy mobile for an infant’s nursery. I just love babies and even though my children are all in “big kid” beds, my brain will not stop coming up with ways to mesmerize the teeny tiny ones! These mobile charms could also be used as “adult” decorations as well. I already imagined hanging this cloud from a cork board as a way to liven up the push pins and papers of “adult” life!